THE MEMO released by the House Intelligence Committee Friday summarizes the evidence behind the biggest scandal in Washington, D.C. since Watergate — or at least it should be. 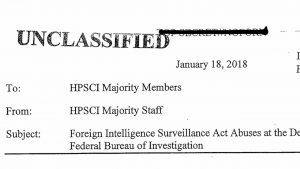 You wouldn’t know it from reports about the memo in the mainstream media. We discuss a disturbing chain of events that reads like the plot of a Tom Clancy novel: Ten days after the election in November, 2016, the Director of the NSA, Admiral Mike Rogers, apparently briefed Donald Trump on the FBI’s illegal use of NSA intercepts to spy on his campaign, which led the Trump transition team to abandon Trump Tower two weeks after the election. The day after Trump moved out of New York, a story leaked to the Washington Post revealed that members of Barack Obama’s cabinet were urging President Obama to fire Admiral Rogers. Further, evidence of the FBI’s abuses convinced the Foreign Intelligence Surveillance Court that the Bureau violated the Fourth Amendment rights of U.S. citizens by providing raw FISA information to private contractors — one of which was presumably Fusion-GPS, the company that assembled the infamous Steele dossier (paid for by the Democratic National Committee and Hillary Clinton’s presidential campaign) that was used to secure a warrant to spy on the Trump campaign. This outrageous politicization of the Department of Justice by the Obama administration goes far beyond the scandal that brought down President Richard Nixon. Also: The dark future of Transhumanism as depicted in the new Netflix series Altered Carbon.